"Saturday Night Live" bid farewell to one of the show's best impressions since the beginning of the Trump administration: Kate McKinnon's Jeff Sessions. Sure, the pint-sized, creepy attorney general could return, but the real Sessions' firing this week precipitated a reminiscing by the show. The show's cold open began with McKinnon's Sessions crawling out from under his desk and starting to pack up his office. "Luckily I've still got the box I was born in," he said. "I'm sorry, I promised myself I wouldn't cry." Of course he packed up his mug as well -- featuring the Confederate flag. He packed up his belongings, including the NAACP's first sarcastic award and a hate letter from Coretta Scott King. "It's not about hatred, it's about heritage," he said. "And then inside there's a second cute mug that says, 'It is about hatred.'" 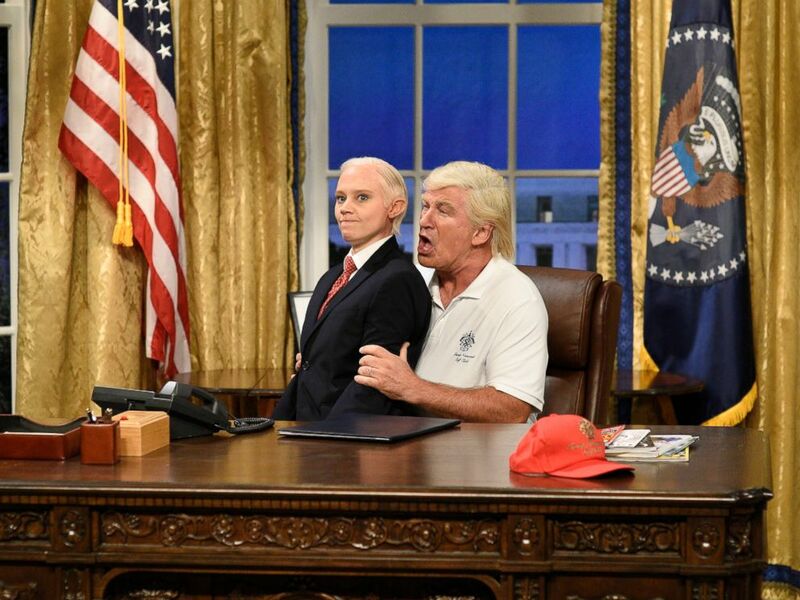 In this image released by NBC, Kate McKinnon portrays Attorney General Jeff Sessions, left, and Alec Baldwin portrays President Donald Trump during the cold open for "Saturday Night Live," on Sept. 30, 2017, in New York. He was paid a visit by dead-on impressions of both Eric Trump and Donald Trump Jr., who told him he should've ended the Mueller investigation a long time ago. That visit was followed by one by Beck Bennett's Vice President Mike Pence, who was very worried by Sessions' mentions of gays, even though he said he hated them just like Trump wanted. "I heard the word 'gays' and 'cages' and I went somewhere crazy," Bennett's Pence said. "And my Apple Watch says I'm having a heart attack." Sessions pulled out a photo of Trump -- well, a photo of Alec Baldwin as Trump, anyway -- and next launched into song. "I really did my best Mr. Trump. I really thought after all this, you'd at least say 'goodbye,'" he said. This brought out McKinnon's best rendition of Adele's breakup song, "Someone Like You." Robert De Niro returned to cameo as Robert Mueller -- to which Sessions replied, "You can't arrest me, I quit." "You're a weird little dude, Jeff," De Niro's Mueller responded. Sessions offered Mueller one final warning though: "With this new attorney general, you might be out of a job soon, too."